DOL intends to issue a Notice of Proposed Rulemaking in March 2019, to determine the appropriate salary level for exemption of executive, administrative and professional employees. The Social Security Administration announced that Social Security and Supplemental Security Income benefits will provide a 8% cost-of-living adjustment in 2019. Charges filed with the EEOC alleging sexual harassment increased by 12% in FY 2018, from FY 2017. And, the EEOC recovered almost $70M for the victims of sexual harassment through litigation and administrative enforcement in FY 2018, up from $47.5M in FY 2017. 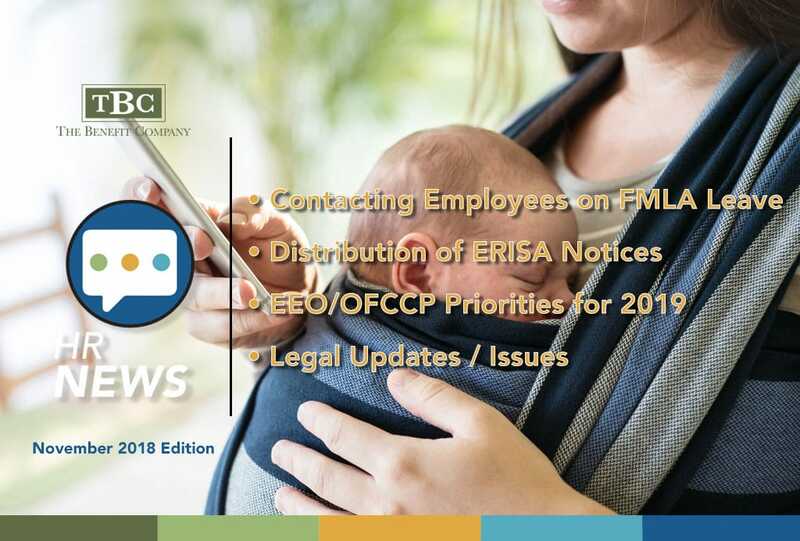 The IRS announced that eligible employers who provide paid FMLA leave to their employees may be able to qualify for a new business credit for tax years 2018 and 2019. See IRS Notice 2018-71 for details. The U.S. Department of Labor’s Payroll Audit Independent Determination (PAID) pilot program was due to expire in October, but it has been extended an additional 6 months. This program offers employers an avenue to quickly resolve potential overtime and minimum wage violations. As HR professionals, we can get a little queasy when someone applies for FMLA leave. Is it legit? What has the supervisor said to Susie that could get the company in trouble? Will Bill string out the FMLA leave for benefit continuation purposes, and then leave the company? Geez. Well, here are some Q&As you may find helpful. Even if they don’t help you answer these questions. Can you contact an employee on FMLA and ask them to return to work? Probably no. Employers are prohibited from interfering with an employee’s exercise of FMLA rights, so you can’t require that an employee work while on FMLA leave. However, this doesn’t mean you can’t contact them about a work-related matter…a short phone call to pass on or request knowledge or updates probably won’t amount to interference. But please don’t ask them to come to the office and process payroll! Can you contact the employee on FMLA leave about a promotional opportunity they might want to apply for? Probably yes. Probably best not to ask them to come to the office to discuss it, or to apply for the position in person, but since this is not asking them to ‘work’ while on leave, this should be ok. If you are conducting a workplace investigation and need the employee on FMLA’s input, can you contact them to ask questions? Are you following your standard internal investigation procedure, and would have taken the same step had the employee not been on leave? Is the employee due back from leave soon enough that perhaps you could wait until he returns to work, and talk with him then? Does his health preclude him from being able to provide valuable input? If you really do need to talk with the employee now, best to do it over the phone. If it is imperative that you bring the employee into the office to talk, consider not counting that time against his FMLA allotment and paying him for that time. Can you contact the employee on FMLA leave to discuss his return to work? Yes! And you will want to, to confirm his projected return to work date so his department can plan for his return, and also to make sure there are no ADA accommodation issues, depending on the reason for the FMLA leave. ERISA requires that the notices are prepared and furnished “in a manner consistent with applicable style, format, and content requirements.” Be sure your electronic versions can comply with the required formatting. For distribution through your company’s intranet or email system, your employees must have “regular access” to it as part of their regular job duties. Having access only through a kiosk is not sufficient access to comply with ERISA. For distribution to those without regular access to your intranet, electronic delivery will only comply with ERISA if the recipient first affirmatively consents to receive the material electronically, provides an electronic address, and demonstrates their ability to access the material this way – i.e., most easily accomplished by the recipient responding via email to the consent request. In addition, all recipients must be notified of their right to receive paper copies of the documents, at no charge, and reasonable steps must be taken to safeguard their personal benefits information. Using the return-receipt feature in email is also suggested…but very burdensome for a large employer. There is definitely a cost-benefit analysis to be done, to determine if electronic distribution of ERISA notices makes sense for your company. AAP verification: The OFCCP is very concerned that although employers confirm in contracting that they have current AAPs, they may not have them at all, or they may not update them annually. Make sure that your post-offer medical screenings have an individual assessment for each position. We know what the government will be looking for—let’s make sure we are ready for them!